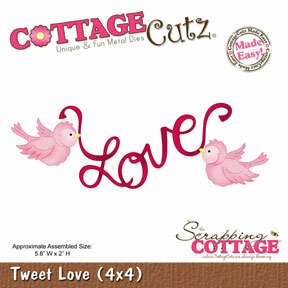 Hello everyone , today I'm sharing my card designed using 4 different CottageCutz Dies. I LOVE this sweet CottageCutz "Puppy Love Carrier" he is too CUTE! I decided to airbrush him using the copic markers, and airbrushing system. I then went in and used some Creative Inspiration Paints on him and the LOVE after they were colored. The Bee Mine frame was done using the same technique. I used the center piece as a templete so I could leave a white area for my image. CottageCutz Dies Used: All are LINKED for easy finding. 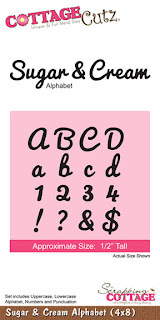 The I and U are from the CottageCutz Sugar & Cream Alphabet Die. I cut them out with white card stock and colored them with black. Lastly I added some RRRibbon, and a button with some gems. 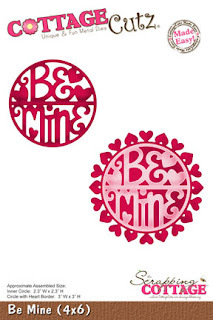 Hope everyone had a Happy Valentines Day!!! This is so adorable Cheryl. The little puppy has the sweetest face. Love how you used the doily behind him. Such a darling Valentine. Your puppy is so sweet, Cheryl. I LOVE the colors on your card and ALL the dies used. BEAUTIFUL!! Oh, such adorable card and great use of all dies.